I’m gonna share a technique that I use to drive traffic to some of my sites and build my subscribers very inexpensively. Ready? Update: The list I had below was severly outdated (since this blog post was originally compiled in 2007), so I recommend you check out this list of 100 contest websites on UpViral. Some directories ask, or even require, a reciprocal link to list your submission, so you may want to make a specific page for “More Contests”. Some links are forums, so you may have to register to post. Once your contest’s end date has arrived, pick a winner (you can even ask the winner to send a pic of themselves to post on the site). Rinse and Repeat! Hope this helps. I read about your success in Revenue Magazine. Congrats! If any of your readers are interested, my sister has a site where she sells customized flip flops for girls. The address is above. I think you’ll like the product, though the website needs lots of work (trying to re-do now). Thanks. I( have never considered running a sweepstake previously until now and what a great idea! Intel’s new big online gaming contest, you can win some of their sweet prizes, daily prizes and the top prize. Its easy, fun, and addicting. The top prize winner wins a trip the trip to Intel where you get to meet their design team and help them create a new gaming motherboard. 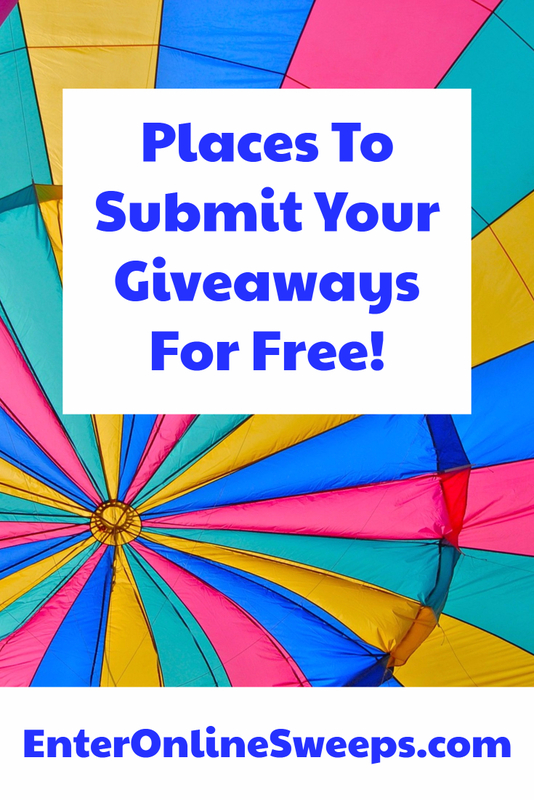 You can always add my page to your lists of places to submit giveaways. I have a giveaway link list at the bottom of my page for anyone to add their giveaways. prizestacker.com No gimmicks and 100% free and never a credit card required. Thank you, perfect list of giveaways submit forms. This article is really helpful, but you have missed one, You also can add one more on your list. I don’t the list where can I see it?